Since 2009, the percent of first-time students still enrolled at any college in their second fall term has dropped 1.2 percentage points. Our “First-Year Persistence and Retention Rates by Starting Enrollment Intensity” Snapshot examines persistence rates for first-time college students between 2009 and 2012. 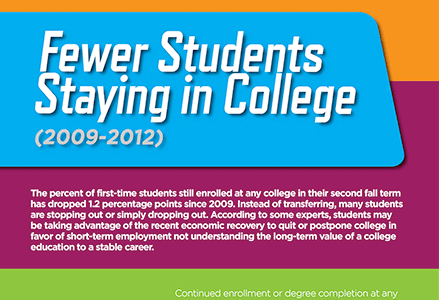 Read more about first-year persistence and retention rates.